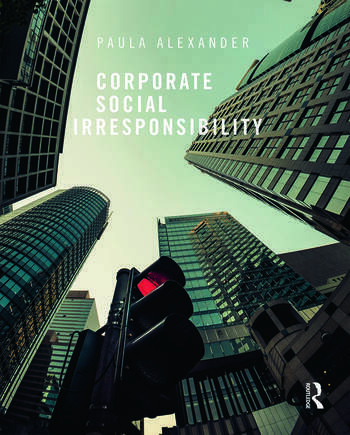 Corporate Social Irresponsibility focuses on ethical failures in order to relate corporate responsibility to business ethics, corporate governance, and organization effectiveness. The book advocates a strategic approach to CSR – ethical management cannot, and should not, be divorced from effective management. Corporate social responsibility has transitioned from oxymoron into a defining challenge of the twenty first century. Taking the recent financial crisis as a starting point, Alexander examines the underlying ethical and legal crises these events expose in the business world. The problems that have come to light go beyond issues of firm financial performance into the integrity of the manufacturing and marketing processes, and relations with consumers. As such, the book presents a model that resolves the apparent conflict between maximizing shareholder value, and meeting the interests of other firm stakeholders. Alexander presents a balanced view, contrasting her model with alternative approaches. The book also covers the impact of globalization on management, the ethics of outsourcing, the limits of regulation, as well as poverty alleviation and social entrepreneurship. Blending a comprehensive theoretical framework with a broad range of cases, this book covers the latest major changes in US legislation, as well as recent corporate scandals making it a valuable accompaniment to any course in CSR, business ethics, or business, government and society. Paula Alexander is an Associate Professor at Seton Hall University, USA. She teaches in the MBA program, and serves as Curriculum Coordinator for corporate social responsibility. She is an expert in affirmative action, and has a background in law.